Storage and History.Chia are edible seeds that come from the desert plant ‘Salvia hispanica’, which is grown in Mexico and dates back to Mayan and Aztec cultures. ‘Chia’ literally means ‘strength’ and folklore has it that these cultures used the tiny black and white seeds to boost energy. They are a good source of calcium, omega 3 oils, protein, antioxidants and fibre. 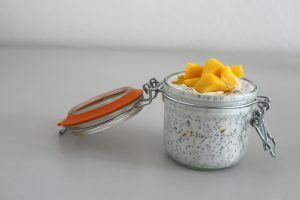 Chia seeds will keep for 2 – 4 years without refrigeration, and more than 4 years if refrigerated. They like a cool, dry location so in humid climates it’s best to keep them in the fridge. Chia won’t go rancid as quickly as flaxseeds do. Even if you grind them into a ‘meal’, they still keep their long shelf life of about 1 – 2 years, unlike flax meal which goes rancid in less than 90 days. Bugs don’t really like these plant oils so usually there’s no need to spray them with toxic chemicals so they are naturally organic. White or Black Chia Seeds? The white ones have slightly more omega 3 oils and the dark ones have slightly more protein. The black seeds have more antioxidants thereby protecting the fatty acids. Buy them mixed!